Two CD's are available. They are professionally made and absolutely beautiful. You can purchase an immediate download or buy the actual CD. Crystal and Tibetan metal bowls, bells, chimes, gongs, cello and Native American flute create a peaceful, serene and healing landscape of sacred sound on this CD by Reverend Sharon Kachel of Attuned with Spirit. 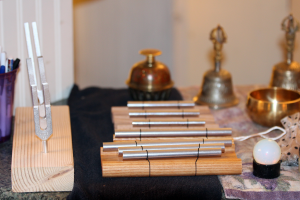 It is perfect for relaxing or to accompany your meditation practice. Using the sacred tools of her healing sound practice, Sharon creates a foundation of blissful tones for each of the four tracks. She begins the journey with Nurtured Heart, a guided meditation, and leads us into a space of healing, grace and blessings. It is here that we can receive the remaining offerings of the CD, including the angelic light created by her collaboration with cellist and composer, Samuel Haines in Coming Home and the gifts of Mother Earth herself in Forest Dream: a collaboration with Native American flute artist, Eric Labacz. With a listening time of over an hour, Sharon provides us with a sacred space to experience our meditations more deeply, raise our intuitive awareness and bring healing into a gratefully grounded life. She hopes you enjoy Bathe in the Bliss of Heaven and Earth and wishes you much peace and blessings. After the first seven minutes, there is a four minute guided meditation piece with affirmations. This allows you to use the CD for just a 10 minute meditation, and if you have more time, just allow it to run up to the full one hour and 14 minutes. Trinfinity8 What does it do?